Rudbeckia, aka Black Eyed Susan, are an old time favorite perennial flower in gardens for centuries. The bright yellow flowers can be seen from afar and add an extra splash of sunshine to the garden. Planted in mass, Rudbeckia have a strong garden impact. Rudbeckia ‘Little Goldstar‘ introduced in 2012, sets itself apart from others in that it is a more compact plant, standing only 16 inches tall. This compact plant has a full bushy habit and is covered in layers of gold flowers. It has been noted that ‘Little Goldstar‘ has had over 80 blooms on one plant at a time. As the old blooms fade new ones cover the existing dead ones, just an exceptional plant to have in your landscape. If you are short on space, no worries… ‘Little Goldstar‘ also makes for a great potted plant! When you think of colors to add to your garden, green probably is not the first color that comes to mind. Green is an obvious color, the leaves and foliage, mostly taken for granted . 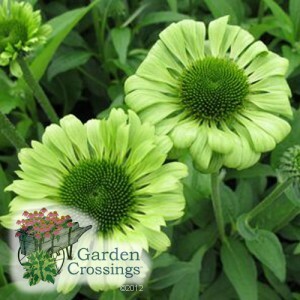 Here we have a unique Echinacea, ‘Green Jewel’. Each flower of ‘Green Jewel‘ is approximately 2 inches across packed with a double row of green petals. The fragrant green blooms make a great cut flower. Echinacea Coneflowers attract butterflies, hummingbirds, and songbirds. In the fall leave the spent blooms, the birds will enjoy the seeds. Enjoy a taste of going green, with Echinacea ‘Green Jewel’. Iris Lion King ( Japanese Iris) HUGE!!! Blooms!!! When I was first going through the catalogs browsing some of the new plant selections I really like the look of Iris Lion King. It was a pretty Bi color and we really did not have any Japanese Iris at the time. It was not until this Iris bloomed that I really could enjoy how beautiful this plant is. 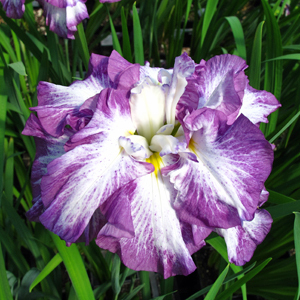 The blooms are absolutely huge, petals upon petals of this double iris produce 7-8″ blooms! Japanese Iris are one of the later iris’ to bloom extending your Iris season. Butterfly Bush Peacock™ Buddleia davidii ‘Peakeep’ has got to have one of the biggest blooms I have ever seen on a Butterfly bush. Right now we have some wonderful 3 gallon pots in bud and bloom and they are just amazing. Each flower is at least 8″ long and much wider than what I can wrap my fingers around. And scent… amazing! Every time I walk past them the smell over takes me and I go back for another whiff. The butterflies are just now arriving in our area, I have seen a few yellow and black swallowtails. And the hummers are also enjoying this garden beauty. Butterfly bush now come in a range of sizes from the compact, mounding form of Butterfly Blue Chip to the tall and mighty varieties or Miss Molly, Purple Emperor, and Peacock just to name a few. 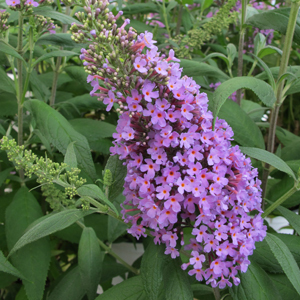 Butterfly bushes have a very long bloom time making them a great addition to butterfly gardens or even as a landscape plant.